Confessions of an ADD English Teacher: Iron Chef Mom: Cranberries! OK, who's up for some more Iron Chef Mom action? This week's featured ingredient is CRANBERRIES! Just in time for Thanksgiving. My contribution is some Cranberry Pepper Jelly... a perfect appetizer for Thanksgiving. Just the right mix of sweet and savory. Before we get to ♥YOUR♥ Cranberry recipes, let's take a look at the winner of Iron Chef Mom: Sweet Potatoes! 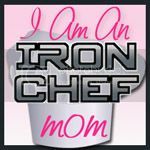 Congratulations on being named an Iron Chef Mom! Grab a button and brag about it! 3. Vote! The link up will end Saturday morning and voting will run from Saturday-Sunday evening! Be sure to stop by this weekend to vote, vote, vote! 4. Grab a party button! 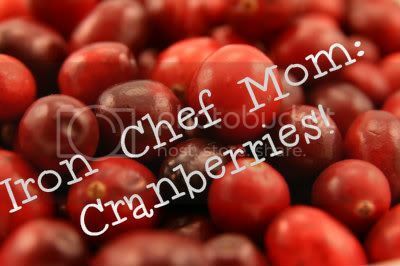 Be sure to VOTE this weekend (Saturday and Sunday) for the Iron Chef Mom CRANBERRY recipe! Stop by next week to see who will be named Iron Chef Mom as well as our top four runner-ups. All top recipes will be pinned on our Iron Chef Mom Pinboard on Pinterest! Thanks for hosting Micki! Happy Thanksgiving! Thanks for the party. I linked up my cranberry relish that I am about to make right now. FYI~ Your FB link in the post above gives an error message. I tried tell you by replying to a comment you left for me earlier, but you are a no-reply blogger. See the comment tips on my blog for info on how to change that if you want. I just realized I'm runner up and thank you! I'm not sure if I can have the feature badge or not. Just want to make sure! Thanks for the pin! Thanks for the invite to your link party....Have a Happy Thanksgiving! Hi Micki, I was totally late to the party so didn't get to submit my recipe, but thank you for "stopping in" on my blog. I am bookmarking this page for Christmastime cooking -- I love all things cranberry!! I don't see voting enabled. When will it start?